How do you make a WWE star? From the outside, it might seem as simple as getting a group of athletic and entertaining people, putting them through some paces in training, and then letting them out for the world to see. But it's simply not that easy. Truth be told, those at WWE don't always know if someone is going to be a star the moment they sign a contract to join the company. That's a big reason why, over the past few years, the WWE has cast a wider net in its search for the next generation of talent. If you tune in to Monday Night Raw or SmackDown Live any given week, you'll see former MMA fighters, football players, gymnasts, weightlifters and amateur wrestlers. They appear alongside those who decided to step into the world of pro wrestling directly, who were trained outside the walls of WWE and traveled the world sharpening their skills until they found themselves on the WWE's radar. Regardless of their backgrounds, the majority of the performers currently appearing on WWE's flagship shows spent time honing their craft inside the WWE's Performance Center in Orlando, Florida. The state-of-the-art facility, which rivals that of any NFL team or major college football program, has a state-of-the-art gym led by Sean Hayes, a former member of the Houston Texans' coaching staff. Next to that room, there's an open space full of rings stretching as far as the eye can see, filled most days by as many as 100 recruits led by at least a half-dozen coaches who are among the brightest minds the professional wrestling business has to offer. That team is led by head coach Matt Bloom, known by fans for his runs in the WWE as Albert and Tensai. Though the crew has evolved over the years, the team currently includes in-ring veterans like assistant head coach Sara Amato (a trailblazer in women's wrestling), Steve Corino, Robbie Brookside, Terry Taylor, Norman Smiley, Scott Garland (aka Scotty 2 Hotty) and Serena Deeb. Oh, and another guy you may have heard of before -- Shawn Michaels. "I've had the privilege to work with many teams, and this is by far the best team I've ever been around," said Bloom. "We have coaches [with a combined] hundreds of years of experience -- but they're all humble. They understand that we don't know everything; together, we know everything, but individually we know important it is to [rely] upon each other." "When you come here, and all the rings are full, it lets off so much energy," said Brookside. "It can't do anything other than inspire you and help you get better." Each WWE hopeful enters the Performance Center every day with the goal of putting in every bit of the work it'll take to get them there. The coaching staff and all of the many amenities the Performance Center has to offer are in place to give them every chance to succeed. On this particular Thursday in mid-October, the rings are filled with a fascinating cross-section of men and women from nearly every corner of the globe, with an experience range of anywhere from freshly started in the world of wrestling to more than a decade's worth of experience. Zoom in a little closer on anyone in the room, and you can find an unbelievable story. Rinku Singh, perhaps one of the most unlikely stories ever to reach the WWE, is eight months into his wrestling journey. At the age of 30, he's already gone from track and field standout, to becoming a literal Disney movie of a story as part of "Million Dollar Arm" in the world of professional baseball, to signing a WWE contract in January after that chapter of his life was over. Then there's Matt Riddle, the former UFC fighter who made himself one of the biggest stars in the world of independent wrestling and kept pushing until WWE could no longer deny him. 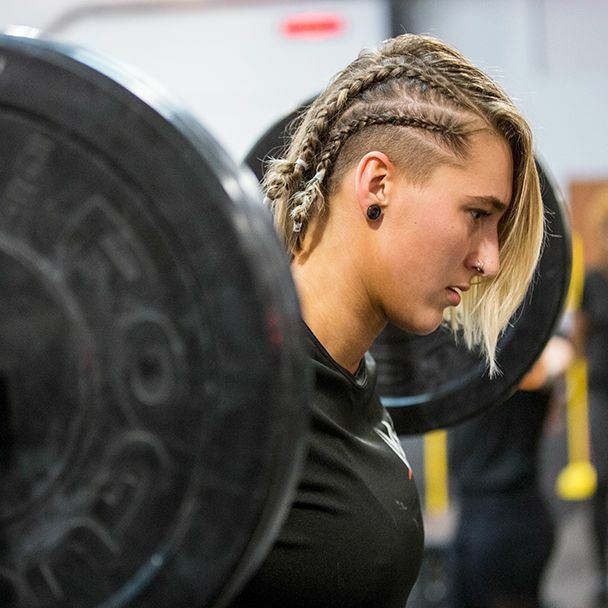 There's also 22-year-old Australian standout Rhea Ripley, who is in the midst of a major coming out party after spending the past year training at the Performance Center. After watching them in action through a day's worth of those experiences at the Performance Center, it's clear that the drive that each of them has on display is well-suited for such a facility and developmental system -- even if each is at a significantly different stage of their lives and careers. Before Matt Riddle signed with WWE, he was one of the workhorses of the independent wrestling world. In 2018 alone, Riddle had 96 matches outside of the WWE. Over the last two years he crisscrossed the Atlantic Ocean time and time again for trips to the U.K. and Germany, and hit 21 states and eight other countries along the way. Still, the high-volatility path of traveling the roads of independent wrestling was a far cry from his previous life in the world of MMA. After competing on The Ultimate Fighter 7, Riddle broke into the UFC and won five of his first six fights inside the Octagon. He continued to impress despite two losses, including a decision that earned "Fight of the Night" honors in Sept. 2011, but from that point on Riddle's UFC journey hit snag after snag. A mix of injury issues and a pair of positive tests for marijuana wiped out what would've otherwise been a four-fight winning streak and, after one final professional fight in 2014, Riddle retired from MMA for good and started pursuing his pro wrestling dreams in 2015. "When I first started, I lived in Vegas, because I was fighting in the UFC and I was still fighting after the UFC," Riddle recalled in an interview with ESPN. "When I started training, there was only one [pro wrestling] gym [in Vegas], so I moved out to Pennsylvania. There were a lot of gyms, so I could get a lot of different looks... I started training at the Monster Factory, started training at CZW's dojo, and I started training at the Ring of Honor dojo." Riddle moved with his wife and three children back to his childhood hometown of Northampton, Pennsylvania. In the early days of his pro wrestling journey, Riddle leaned heavily upon his MMA experience to guide him. Just as he had trained in a number of different disciplines to make himself a well-rounded fighter, Riddle traveled to a number of different schools and seminars throughout the Northeast United States to try to shape himself into the ideal pro wrestler. After grinding hard for a couple of years, Riddle's in-ring presence and personality allowed him to rise through the ranks of some of the top independent promotions in the world, including Pro Wrestling Guerrilla, PROGRESS, EVOLVE and wXw, among many others. Finally, in August at NXT TakeOver: Brooklyn IV, Riddle appeared in the crowd and announced to the world that he had finally made his WWE dreams a reality. In the months that followed, Riddle finished out his independent commitments and prepared himself for the next step in his life and career. "I moved my family down here, I've got three kids and a wife, so it's nice," Riddle said of the change of pace, in the month since he'd started at the Performance Center. "I just wrestle in Florida every weekend. We occasionally do tours or TakeOvers, but for the most part, now I get to spend more time with my family. I'm more local, and it's great. "The training here is top-notch," Riddle continued. "Where I was, I was lucky to even train three times a week, because my schedule was so insane -- and I didn't have the coaches or amenities to do [much more than that]." If the day we got to watch at the Performance Center was any indication, Riddle has taken to his new routine like a fish to water. 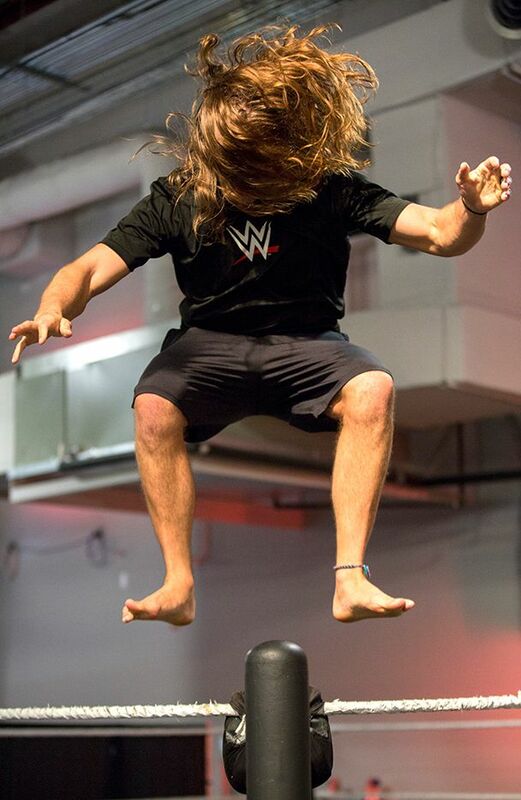 After formal classes alongside a couple of his pre-WWE friends like Keith Lee and Donovan Dijak(ovic) among a dozen participants in his group, Riddle headed over to a ring specially constructed to try out high-flying moves. While Riddle isn't the first WWE superstar with an MMA background, following former UFC standouts Ronda Rousey, Ken Shamrock and Dan Severn, to name a few, Riddle's offensive repertoire in the ring is far more varied than what you might expect from a typical bruiser. Even with his trademark barefooted look, he hops off the ropes and turnbuckles without the slightest hesitation, completing spins and rotations with ease. Though there are some familiar faces hanging around the ring post-practice, Riddle's gregarious personality has already helped him to become a friendly face for newcomers and Performance Center veterans alike. "I'm already a personable person. I always try to smile and get to know somebody and say hello -- even when people are trying not to talk to me," Riddle said with a grin. Still, when it's time to get serious, Riddle is among the brightest prospects in the WWE pipeline. He would ultimately go on to make his in-ring debut for WWE's third brand, NXT, at their TakeOver special in Los Angeles in mid-November. In a match that lasted less than 10 seconds, Riddle scored an instant knockout against Kassius Ohno and garnered a tremendous reaction from the live crowd. "I just feel like I belong here," said Riddle. "I felt like I belonged here three-and-a-half years ago when I had my first try out." Five years into a pro wrestling career feels about right for someone hoping to get a shot with WWE, but not many people get that first chance at just 20. For Rhea Ripley, to whom both of these statements apply, the last year-plus in particular has been a whirlwind. After making her WWE TV debut in the first Mae Young Classic tournament in July 2017, the Adelaide, Australia native settled into life in Orlando and the WWE Performance Center. It would be a tough move for anyone to manage, but to go halfway around the world for the job of your dreams before you've even turned 21 is a lot to process. "The most challenging bit about coming here to the Performance Center was, not the training so much, because with training, I've always been on the dot with [that]," recalled Ripley. "It was just the being away from family. It was the mental side of everything -- coming in here and being all by myself, not really knowing anyone but the other Australian boys, but then not even having them in my class." As she settled into her routine, Ripley made all of her progress away from the WWE cameras. Outside of a one-off appearance on NXT TV, Ripley trained every day and performed on the local NXT events all over Florida. In that time, Ripley overhauled her ring gear, appearance and on-screen personality, and by the time she reappeared as part of the second Mae Young Classic, Ripley was an entirely different kind of performer. She showed out in a big way in that tournament, making it to the semifinals with several standout performances along the way. In August, Ripley continued to build her profile as she became the first ever NXT U.K. women's champion. In October, in a match contested only for the live audience at the first ever WWE all-women's pay-per-view, Evolution, Ripley and Dakota Kai both receive rave reviews from the crowd for their respective performances. From all appearances, this newfound level of success hasn't done much to slow Ripley down. Quite the opposite, in fact, if her performance during the workout on the day ESPN was in attendance at the Performance Center are any indication. In-ring drills are followed by an intense workout session in the gym, after which Ripley remains in good spirits. Part of that likely has to do with the level of comfort with the rest of the crew at the Performance Center, which is clearly on display. The rest can likely be attributed to building up a comfortable home life for herself to go with it. "After being here for as long as I have, I've definitely settled in a lot better," said Ripley, "And now that I have my dog as well, I've at least got someone to go home to, which is really nice. She's going to love me no matter what." One message that comes through loud and clear when talking to the coaching staff at the WWE Performance Center is their desire to impart their collective knowledge to the next generation of WWE. In another era, they'd put the men and women in their charge through the same rigors and challenges they experienced, but with time and experience also comes an understanding of how to synthesize certain lessons and present them the right way. The recruits of WWE don't have it easy by any means, but they won't be enduring the kind of intense and often cruel hardships that many of their coaches went through. "I learned in Walden, Massachusetts, under the tutelage of Killer Kowalski," recalled Bloom. "It was a wrestling school on the fourth floor of a warehouse. I worked in a space that is not even close [to the Performance Center], in a boxing ring. We had one air conditioner in a window, and it was a very unforgiving ring. We learned in a much harder way than it is today." "Everything was designed to hurt you and break you," said Brookside, of the struggles of breaking into the British wrestling seen as a teenager. "You'd come [into the ring and] they tied you up in a knot and dragged your face [on the mat]. Then you come out and the promoter and the wrestlers would have a go at you, and then basically point at the door and say, 'Get out -- you don't belong here.' I don't mind telling you -- I cried a lot when I was on my own. You'd be hurt -- your elbows, your neck, either side on the bottom of your spine. You'd get salt in your tea, you'd get WD-40 if you fell asleep in the car. That's just the tip of the iceberg. "That's what you had to do -- you had to endure and go through this period which felt like 10 years, but in actual fact it was probably two years, but when you do it every day... it was a baptism of fire kind of thing." "It's more positive," said Brookside. "I think what I went through has helped other people further down the line, because I know what it's like to come back from a match when you're told you're no good. I know what it's like to feel the wrath of someone's anger, when you go in the next day and you're walking on eggshells. When someone makes a mistake, it's not a bad thing. You make a mistake, you pick yourself up, dust yourself off and you go again. I think if you nurture that, the way I teach, it's about helping people, about giving people confidence and self-belief, and I think this place, that's what it does." The versatility that comes with having a diverse well of experience to draw from is also vital in crafting different approaches for a vastly differing group of recruits. "Everyone's different. When you've got someone like a Matt Riddle, who's been grinding it out on the independents, when he walks in here and you see the smile on his face, that's pretty cool," said Bloom. "But then we have some of our international [talent] who come in here and don't really have an understanding of what WWE is, or what the background is, so they come in here and they're taken aback by this amazing vision in front of them. "They learn, through hard work, what it takes to do what we do."